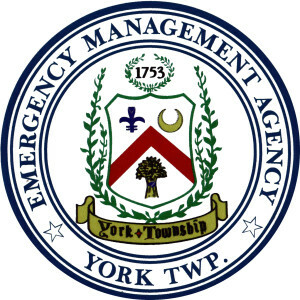 York Township Emergency Management Agency provides emergency planning for the residents, businesses and facilities located within York Township. Emergency management is staffed by a volunteer group of township residents. If anyone would like to volunteer to help or has questions about Emergency Management please contact the Coordinator. If they are not available please contact the staff person closest to your area. You can also find the EMA on Facebook. Click the date of the meeting to view it’s minutes in PDF format. The group meets in the Training room of the York Township Administration Building on the third Thursday of each month at 7:00 p.m. Please contact Emergency Management Coordinator, Kathleen M. Dellinger, if you would like to be our guest at a meeting. Tip of the Season: Identify ahead of time where you and your family will go if you have to evacuate. Make sure that you have local and regional maps in your car if you have to travel unfamiliar roads. For additional tips, fact sheets, and podcasts, visit the Centers for Disease Control and Prevention (CDC) web site: www.cdc.gov. Below are some links to emergency related sources for more information.